after they worked with Abilities United. Two minutes after her son Joe was born, Jennifer Kaufman’s pediatrician walked into the delivery room and coldly said “your son shows all the signs of Down Syndrome.” He then turned and walked out of the room. Through physical therapy at Abilities United, Joe would learn to walk and take his first steps when he was three years old. “That was monumental,” says Jennifer. Jennifer, who had previously been a teacher herself, was so impressed with Abilities United that she applied to join the organization. With her energy, compassion, teaching background, and experience in raising a child with a disability, Jennifer has been a wonderful fit. For eight years she’d been a teacher in the Abilities United Early Intervention Program, working with children from infancy to age three. 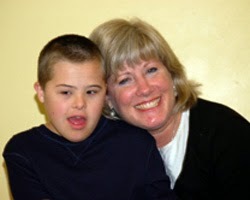 She is a beloved teacher and friend for many children with disabilities, as well as their families. Today Joe attends a public school, and together with several other kids at school, he has the job of raising the flag each day. Jennifer is proud of Joe having this responsibility. Abilities United is proud to have worked with Joe, and we’re fortunate to have wonderful staff such as Jennifer. Based on a 2012 interview with Jennifer Kaufman. Written by Bob Thomas. Edited by Jennifer Kaufman and Wendy Kuehnl.